O DAIJI NI.THE CHIASA PAPERS. BRIEF DESCRIPTION OF-MAYERLING,THE VON KRUGER NOTES. THE SAME STORY AS REPORTED BY VON KRUGER,THE HEAD OF THE GERMAN SECRET SERVICES. BRIEF DESCRIPTION OF "RED SUN RISING"
CHIASA,THE DAUGHTER OF BARON ENDO,WARNS SIDNEY OREBAR OF A JAPANESE ATTACK IN VLADIVOSTOK,WITH THE HELP OF COUNT SAGRO AND OF THE ILLUMINATI.SIDNEY,MOIRA AND AMELIA FLY TO RUSSIA AND WITH THE HELP OF COUNT PAVEL AND GRAND DUKE MICHAEL PREPARE A PLAN TO DEFEAT THE JAPANESE.BUT THEY NEED THE TARTARS AND ,FOR THAT, FATIMA THE DAUGHTER OF KARIM KHAN PLAYS A CRUCIAL ROLE.PURE ADVENTURE AGAIN. See the new updated version. BRIEF DESCRIPTION OF "DARING TIMES". THE TALE BEGINS WHEN OPHELIA WAS MENACED OF BEING KIDNAPPED.MARION SHUSTER THE GERMAN AGENT,KILLS THE KIDNAPPER AND OPHELIA GOES TO ENGLAND FOR HER PROTECTION.MEANWHILE HER FATHER IS KIDNAPPED,ALSO BY THE ILLUMINATI,WITH THE SUPPORT OF THE POLICE INSPECTOR SCHREIB..SIDNEY OREBAR AND MOIRA HUNTER FROM THE BRITISH SECRET SERVICE AND MARION SHUSTER AND VON KULOV FROM THE GERMAN ONE,INVESTIGATE AND ARRIVE TO THE CONCLUSION THAT THE MAIN TARGET IS THE EMPRESS ELIZABETH.THEY JOIN FORCES TO FIGHT THE ILLUMINATI AND FINALLY WIN THE CHALLENGE. A BRIEF DESCRIPTION OF " THE SHIELD OF ISIS"
BY THE SPHINX,BUT TO GET IT IT WAS NECESSARY TO GIVE THE CORRECT ANSWER TO A COMPLEX RIDDLE. A BRIEF DESCRIPTION OF "DRAGON BROTHERHOOD". several islands with big tidal waves.Once more,the british and german secret services join forces to challenge the potential tragedy. INFORMATION ABOUT THE OPERATION AND DECIDED TO INTERVENE,SENDING TO EGYPT THEIR SOPHISTICATED KILLING MACHINES.COUNT PAVEL,THE RUSSIAN AGENT INFILTRATED IN THE SECT,WARNED MARION SHUSTER,THE GERMAN AGENT,WHO TOLD SIDNEY OREBAR,THE BEST BRITISH SECRET AGENT. WHAT FOLLOWS IS AN ADVENTURE FULL OF ADRENALINE. By the end of January of 1889, Archduke Rudolph ,heir to the throne of Austria ,and his lover,Maria Vetsera,were found dead ,in the royal hunting lodge of Mayerling.Various theories came ,immediatly to life,being the double suicide ,the most popular. The mother of RUdolph,Empress Elizabeth, asked her friend, Dina of Vattenlad to expose the killers of her son,as she did not believe in the suicide version. Dina asked Sidney Orebar to come and help.On the other hand, Count Pavel ,the russian agent infiltrated in the Illuminati, told Marion Shuster,the german agent, that the Illuminati did it,having recruiting for the effect,the mercenaries of Madame Chu.so,again the secret services of Germany and Britain joined efforts to demask and eliminate the killers. Another big adventure starts. Flames over the Nile.Updated Version. The Enigma of the Tarot Killer.Updated Version. THE SCARABS OF ANUBIS.UPDATED VERSION. THE SECRET OF KING SOLOMON'S MINES.UPDATED VERSION. "M",the leader of the Illuminati,was an alien and his intention was to bring back to life his companions buried in Egypt for more than 4.000 years,in order to reinforce the power of the sect and to challenge the world.In this adventure,both british and german join forces and ,even Crow,gives a hand.The british can take advantage of an experimental flying machine,while "M" puts to work an old space disc,hidden in Egypt,for many centuries. smashed between Germany and Austria. killing machines of the Illuminati. Orebar accepted to help Marion to rescue his partner. Illuminati members decided to strike in India.The secret sect established the plan to destroy several princely states,putting the blame in the british,having in mind a general uprising against british rule in India. best field agents,Amelia Star and Sidney Orebar, challenge this mighty force. This,non-fiction work is no more than just a glimpse at the victorian age and at the man ,who during two mandates was Prime Minister of Britain,in a period of "grandeur" of the Empire,but ,also.of confrontation. Four friends are stabbed to death by a mysterious killer who lets besides their bodies,tarot cards.What looked like a serial killer ,in the style of Jack the Ripper,became a spy case,concerning the plans of a flying machine.When Sir Mortimer Hunter,the head of british secret service, and his agents ,Moira Hunter,Amelia Star ,and Sidney Orebar,began the investigation,quickly they were confronted with the Illuminati secret sect.An extraordinary adventure. The scarabs of Anubis were stolen from the british barracks,in Cairo. But to be the weapon of mass destruction,they need a remote control.Professor Hudson (a nice american,called Hu by his friends) believes that he has that device. adventure,where Sir Mortimer Hunter,his daughter Moira,and the secret agents Amelia Star and Sidney Orebar hunt those who want both the scarabs and the device. a serial killer, using scarabs as weapons of mass destruction,destroys villages and terrorize the population.Von Sterben/Crow,changes again his visual and is now Von Kulov,working for the german secret service and having as partner,the beautiful Marion Shuster.In Egypt,Sir Mortimer Hunter,Moira Hunter ,Amelia Star and Sidney Orebar look for the killer Anubis.Human or alien ? Ridder Haggard was right about the existance of the Mines of King Solomon. But its location was not in southern Africa,but in Egypt.This,Professor Egee told to Sir Mortimer Hunter,head of the secret service in Britain.And an incredible adventure began,in search of the secret of the knight templars. Sir Mortimer ,with Amelia Star,his assistant,Moira Hunter ,his daughter, and Sidney Orebar,challenged the prussian army ,Von Sterben and the Mahadi and his men. suspense,adventure,the foes: the Mahadi and Von Sterben (Crow) and Egypt and his land full of history and enigmas. They are about fiction,inspired in an historical background.Their intention is to amuse and entertain the reader. WITH A NEW TOTAL VISUAL,FORTUNE AND MISFORTUNE ". A TALE OF A MACHIAVELIC PLOT TO STEAL INDIA, " THE JEWEL OF THE CROWN" FROM THE BRITISH EMPIRE,CONDUCTED BY KING STRAVOS AND BY CROW,THE MASTER SPY. BENJAMIN DISRAELI,THE BRITISH PRIME MINISTER COUNTER ATTACKS SENDING SIR MORTIMER HUNTER ,HEAD OF THE BRITISH SECRET SERVICES ,HIS DAUGHTER,THE LOVELY MOIRA HUNTER ,AND THE BEST FIELD AGENT,THE BEAUTIFUL AMELIA STAR, TO INDIA TO ABORT THE "COUP"
steals the Global Bomb,a weapon he intends to use to conquer Egypt and after that,the whole muslim world. fight this fanatic ,in England and Egypt. With a total new visual,this tale is about the operation led by Sir Mortimer Hunter,his daughter Moira and Sidney Orebar ,to rescue the real Khedive of Egypt ,prisoner of the Mahadi and Crow.Great adventure. WITH A NEW,MORE APPEALING VISUAL,THE " LOST CROWN " IS A GREAT ADVENTURE. TO BE CROWNED KING OF VATTENLAND, PRINCE KARL NEEDS TO SHOW THE CROWN THAT HE GOT FROM HIS FATHER, THE LATE KING PAUL. ONE WEEK BEFORE THE CORONATION CERIMONY,KARL REALISES THAT THE CROWN WAS STOLEN. HIS WIFE,PRINCESS DINA ASKS FOR HELP TO HER COUSIN,QUEEN VICTORIA,WHO SENDS SIR MORTIMER HUNTER,HIS DAUGHTER ,MOIRA, AND SIDNEY OREBAR-THE BEST BRITISH AGENT,TO HELP HER. THE SITUATION IS COMPLICATED,BECAUSE,ACCORDING TO LOCAL TRADITION,ANYONE WHO FINDS THE CROWN ,IS RECOGNIZED AS KING OF VATTENLAND.AND CROW,ALIAS,VON STERBEN,IS NEARBY. With a new fabulous visual. THIS ONE IS PURE ADVENTURE AND SUSPENSE. THE PRINCE OF WALES,THE FUTURE KING EDWARD VII,INVITED THE KHEDIVE OF EGYPT FOR A BUSINESS VISIT TO BRITAIN. THE VANISHING OF THE FATHER OF ONE OF MOIRA HUNTER'S FRIEND,OPENED THE WAY TO AN INVESTIGATION LED BY SIR MORTIMER HUNTER,HEAD OF THE BRITISH SECRET SERVICES,SIDNEY OREBAR,THE BEST BRITISH AGENT,AND MOIRA HUNTER,HERSELF.WHAT YOU WILL SEE WILL SURPRISE YOU.AS USUAL THIS TALE -TAKING PLACE IN THE VICTORIAN AGE- IS FILLED WITH ACTION,SUSPENSE,INTRIGUE AND HUMOUR. Incredible adventure..Crow,alias, Von Sterben,escapes from prison (see Royal threat ) and asks the british government ,one million pounds ,menacing the authorities to make London explodes if they decide not to pay him. Crow plans to keep his promise as the government will not pay. So he will make explode the "EYES OF ISIS" a mysterious lethal weapon ,lost for centuries in the sands of Nubia. Sir Mortimer Hunter ,head of secret sevices, his lovely daughter Moira ,and the best british secret agent ,Sidney Orebar, fight Crow in a very tight confrontation.In the last moment,the contribution of Mirna , becomes cruciaL. This is a site about books and in particular,about e-books. I wrote these books for my children and grand children,but ,today,i feell that i should share them . buy in blurb Until now ,I wrote four victorian tales: Fortune and Misfortune, Royal threat, the revenge of Crow and OdaIJI ni,but more are in the way. ODAIJI NI IS A FANTASTIC ADVENTURE. THE ACTION TAKES PLACE IN LATE'S 19TH CENTURY JAPAN. CROW,ALIAS,COUNT VON STERBEN ,IS SET FREE BY A BRITISH COURT ,BY LACK OF PROOFS ,RELATED TO HIS ATTEMPT TO MAKE LONDON EXPLODES. HE TRAVELS TO JAPAN AND IS HIRED BY BARON KURITO,WHO WANTS NO MODERNISATION OF JAPAN AND THE PRESERVATION OF THE OLD WAYS,OPPOSING THE REFORMIST PARTY ,HEADED BY BARON ENDO. THE JAPANESE AUTHORITIES ASK THE BRITISH FOR HELP AND ,THEREFORE, SIR MORTIMER HUNTER, HIS LOVELY DAUGHTER MOIRA AND ,SIDNEY OREBAR,THE BEST BRITISH SECRET AGENT ,TRAVEL TO JAPAN BY BALLOON TO GIVE A HAND TO BARON ENDO AND TRY TO STOP CROW. BESIDES FIGHTING BARON KURITO AND HIS NARA NINJAS,THEY WILL DEFY THE DEMONS AND SPIRITS OF THE NAGA FOREST. 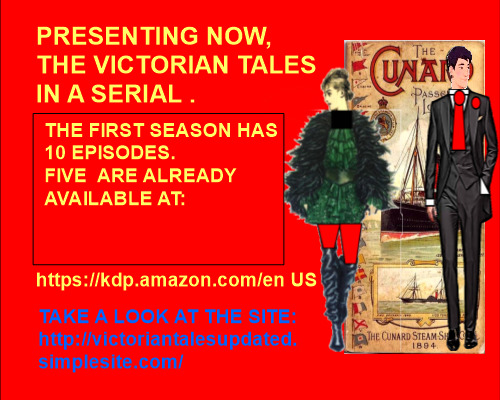 THIS ADVENTURE,FULL OF ACTION AND SUSPENSE AND HUMOUR ,IS PART OF THE SERIAL "VICTORIAN TALES " WHICH UNTIL NOW ARE 4 : FORTUNE AND MISFORTUNE, ROYAL THREAT, THE REVENGE OF CROW AND ,NOW, ODAIJI NI.